I make these often. It's easy and quick. I use toasted pecans rather than sesame seeds. Meeting for drinks doesn't have to mean grabbing a beer at the local bar anymore. With cocktails more popular than ever people want to do their entertaining at home. 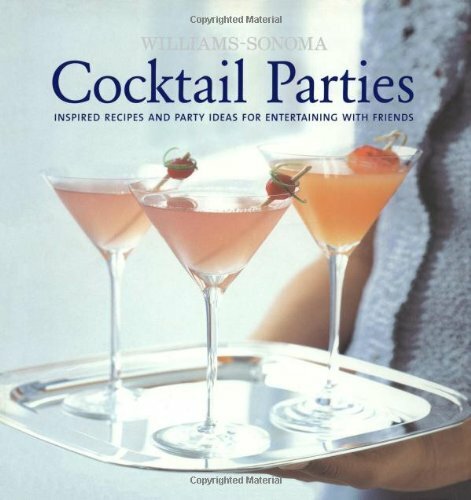 Cocktail Parties: Williams-Sonoma Entertaining is filled with fun party ideas, instructions for perfect drinks, and the perfect food pairing. It is exactly the book everyone needs to entertain at home in style. Equal parts cookbook, instruction manual, and idea generator, Cocktail Parties takes the worry--and stress-- out of hosting an event. With fifty simple, all new and delicious recipes for drinks and food, the book is organized around seven theme menus, such as Summer Cocktails, Saturday Night, and Impromptu Gathering. Helpful checklists and tips on bar stocking, tale decorations, and other essentials make planning easy .